The winter solstice marks the official start to winter, which, until I moved to Alaska, always seemed sort of extraneous to me: there had been snow on the ground for weeks, usually, and I’d long since traded in shorts and sandals for mittens and boots. This beautiful sunset happened at 3:30 last week. “It’s the longest night of the year,” I’d hear people say, and while this idea sounded sort of spooky and romantic, the difference between the longest night of the year and the second- and third-longest nights was marginal—a second or two, at most. The sun rose a little later and set a little earlier, but the nearly nine-and-a-half hours of sunlight my hometown sees on the solstice felt like enough. 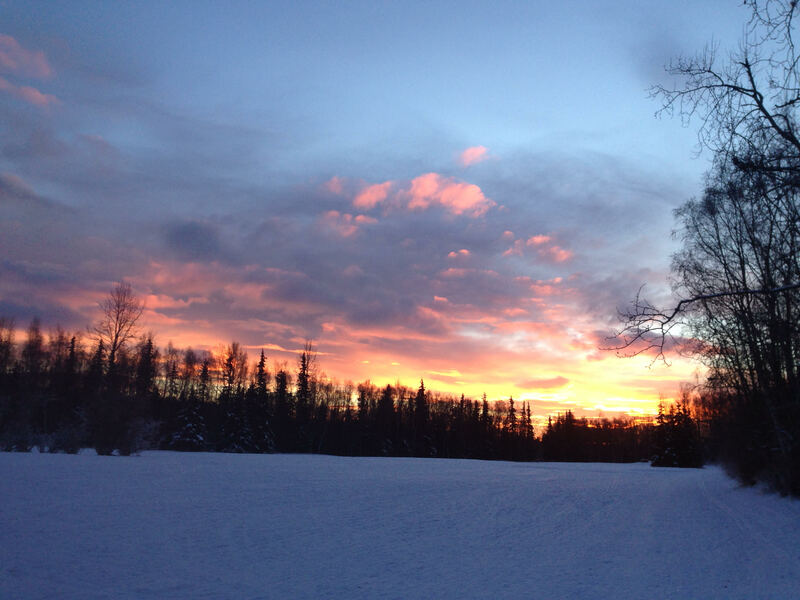 This solstice, there is little snow on the ground, and while I’ve been wearing boots around town for weeks, it does not yet feel like winter in Anchorage except for the ever-tardier sunrise, followed what feels like moments later by an admittedly spectacular sunset. The peaks of the Chugach front range, bathed in soft pink alpenglow, appear to be locked in perpetual twilight, their shadows growing longer and longer until they disappear altogether into the darkness. It’s a picturesque six hours, but it doesn’t last nearly long enough. Snow, that harbinger of winter, takes the edge off the darkness, and despite promising signs early this fall, it took its time to arrive en masse the this year. The first decent snow of the season came in late October, and I found myself feeling extra grateful to have escaped our hovel in midtown. Leaving in still-darkness to negotiate city traffic all the way across town was, on many days, almost too much to bear. You’ll never catch me leaping out of bed in the pre-dawn hours of a Southcentral Alaskan winter—which, to keep things in perspective, is anytime before ten or so—but on this first snowy day, I did not dread my commute. That’s because I love bike commuting, even the objectively crappy parts: the rush of righteous indignation when a motorist turns in front of me and I have a “walk” signal, choking on diesel fumes as I bypass an especially jammed swath of traffic. I’m lucky to live close enough to the (excellent) Anchorage trail system that very little of my commute to work takes place on or near a road. 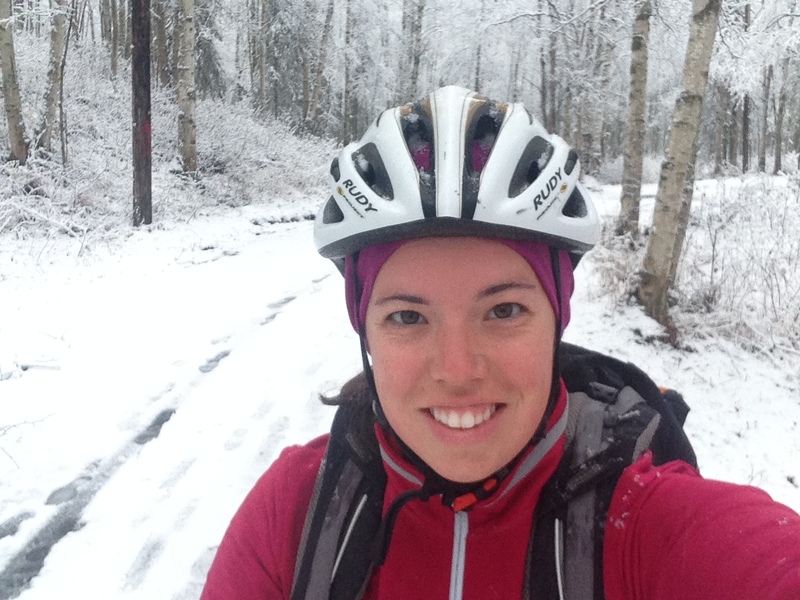 Instead of navigating traffic, I do my best to keep my studded tires out of the icy ruts on the bike path. Rather than being shouted at by passing drivers whose sensibilities I am upsetting with my very presence, I exchange friendly nods with other cyclists and skiers and steer to avoid the occasional moose. I arrive at work not feeling cranky and bored, but refreshed and maybe a little sweaty. Commuting to work by my own power has saved me from my usual winter blues. Don’t get me wrong: it still feels a little overwhelming to spend this much of my day in darkness. I still have bad days where the thought of getting out of bed, let alone going to work or interacting with other humans, makes me feel like crying. 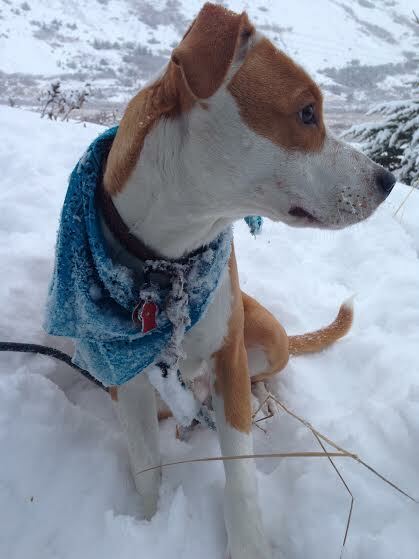 Bodhi enjoys a snowy walk in his solstice finery. But unlike my two previous winters in Alaska, I feel some hope. If I can survive—thrive, even—on five hours and twenty-seven minutes of daylight, imagine what I can do with adequate vitamin D in my system! I am using my winter solstice to reflect on things I’m grateful for: I think I’ve grown up since I moved to Alaska all those days ago, and I like the person I’m becoming. I earned a master’s degree and a job I’m thrilled to have. I get to go outside every day, and that keeps me going even when it feels impossibly dark. Here’s to longer days and stronger light. Happy Solstice!